From defining stocks and shares to explaining how the stock market works and how economies are interdependent and affect each other, Elementary Economics for Fifth Grade: Interdependent Economics homeschool social studies students learn about the concept of a global economy and different types of markets. Elementary Economics for Fifth Grade: Interdependent Economics homeschool social studies lessons use printable activities, discussion, and supplemental videos to teach homeschool students fundamental concepts in economics. Talk about the factors in an investment strategy. Make a list of things to consider when putting together an investment strategy (inflation, risk, growth, interest rates, etc.). Plot on the line graph the stock you chose. Discuss different places that can help you make an investment (stock broker, advisor, internet, TV, radio, etc.). Discuss different types of investments that can be made (stocks, mutual funds, bonds, etc.). Do research on the stock you chose to plot on your line graph. Pay attention to the way the stock increased and decreased in the past. Make a hypothesis on how you think the stock you chose will act in the next week based on previous data and the data you have collected over the last week. 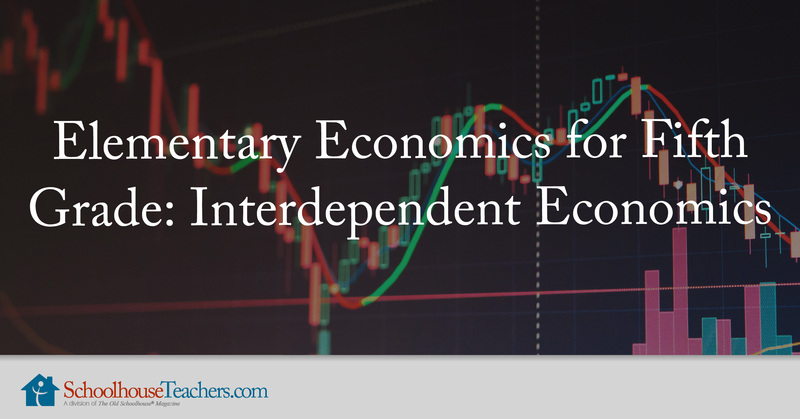 Through printable activities, discussion, and supplemental videos, Elementary Economics for Fifth Grade: Interdependent Economics homeschool social studies students learn the basics of how the stock market works and how one country’s economy can impact another’s. 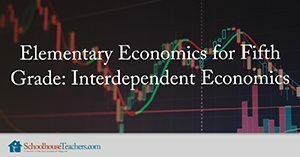 Would you like to tell others about this Elementary Economics for Fifth Grade: Interdependent Economics homeschool social studies course?